This series in QuantumLimit.com represents what we believe to be the greatest explorations of the past 100 years. “The greatest” is defined as those which have had and will have the greatest impact on more humans now and in the future. Here is the one we choose to begin with– the first expedition to the South Pole. The expedition was planned and led by Norwegian Explorer, Roald Engelbregt Gravning Amundsen. Amundsen was in a fierce race to be the first to the pole. Already on the ice covered continent was another team headed for the same destination led by Robert Scott. The Amundsen team arrived at the South Pole on December 14, 1911 during the peak of the southern summer, just 35 days ahead of Scott’s team. This was a most remarkable exploration in that the teams were pieced together by individual explorers and all the funds were raised by the team leaders themselves. It was a time of individual exploration by men from free cultures who were not limited by anything except their sheer imagination, ambition and a life-or-death courage. The technology was primitive. They sailed the treacherous, iceberg laden Antarctic seas in wooden sailing ships. The charts of the Antarctic shores were ill defined and there had been many expeditions to these regions that were lost and never heard from again. Some ships were crushed by drifing ice packs driven by uncertian winds and their helpless crews were left stranded on the ice to die. 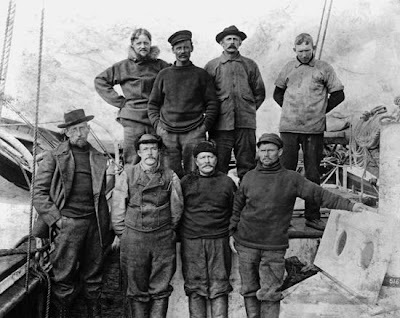 Amundsen and his crew are shown here onboard his ship during the expedition. When Amundsen’s team departed their ship and headed south across the perpetually ice covered continent, they saw things no man had ever seen before, their feet walking on a massive ice shelf that overlay a continent not just lost but captured by a perpetual ice age that has no end. As their team headed away from their ship, they knew there was no guarantee it would be waiting for them when they returned. 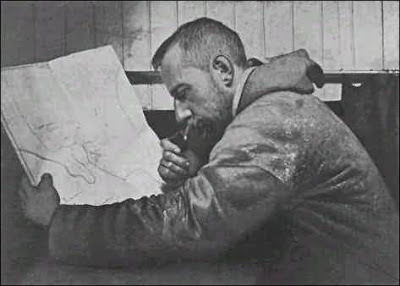 What Amundsen and Scott accomplished was not only significant in laying human hands on a whole new continent and mapping what no other man had ever seen – but it was an historic accomplishment in the entire spectrum of human determination, planning, skill and daring. Roald Amundsen was the first person to reach both the North and South Poles and was the first to traverse the Northwest Passage. He disappeared on a mission to rescue a fellow explorer in 1928.